Very rare map illustrating the Manhattan districts of Chelsea and Hell's Kitchen, including the Hudson Yards megadevelopment. Map of the Glass House Farm Also the Schroepple, Ray, and other estates down to the Franklin and Robinson and the Widow Mary Clarke and Thomas B. Clarke. A rare 1873 John Bute Holmes cadastral of part of the Manhattan (New York City) neighborhoods Chelsea and Hell's Kitchen. The map covers northern Chelsea from 27th street to the southern part of Hell's Kitchen at 42nd Street. It also covers from the Hudson River to 8th Avenue, in the process including the current mega-development of Hudson Yards. This is one of a series of 21 scarce maps drawn by Holmes between 1867 and 1875. Like all maps in this series it was independently issued, is quite large, and impressively detailed. 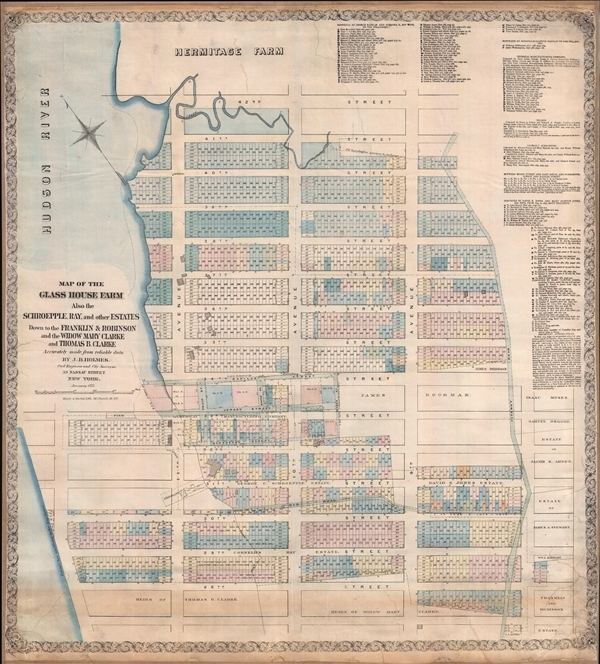 The maps were intended to illustrate real estate holdings at a point in New York history when vast estates in central and upper Manhattan were being broken up and segregated among numerous heirs. This led naturally to countless legal battles, much of the litigation behind which, depended upon detailed cadastral maps like this one. The current map illustrates the breakup of the Glass House Farm, as well as the estates of George C. Schroepple, George Rapelje, and Cornelius Ray. Some of these claims date to the early Dutch period of New Amsterdam, but were honored by the British even after the takeover. The breakup of the estates is detailed via tables in the upper right quadrant, where individual heirs and landowners are identified. Each is referenced by New York City record book and page number. The map's namesake, the Glass House Farm, was a large farm situated between the Hudson River and Fitzroy Road (as shown on map) in today's West 30s. The unusual name, Glass House, refers to a short lived glass factory that was established on the location in 1754. There was also a nearby tavern of the same name that, at the time of the American Revolutionary War, was a popular roadhouse and inn. The street names on this map reflect the original owners of the farm. This map is rare. The OCLC identifies only 2 other examples, one at the New York State Library, and another at the University of Wisconsin. Very good. Some toning lower 3 inches or so. Repaired tears. Professionally backed on archival linen.